With Meireles gone and Essien returning back to his “Daddy” it seems that we have left ourselves fairly short in the central midfield area this season, or rather the 2 in the 4-2-3-1. Last season one man that really made a impression on me in such a short period of time was Oriol Romeu, when played, he was a super quick passer, and almost always managed to retain possession, very similar to the skill sets I see In Josh McEachran, and the definition of a Spanish defensive midfielder. On the other hand, although I was astonished to note Mikel’s passing statistics this year (at least 90% passing accuracy in every premier league game so far) I still feel that there are some serious flaws within his game, and these flaws can’t be left unmanaged especially in the new playing style we are trying to install at the club. He can be caught out at the worst times, often it’s his simple mistakes that can lead to unnecessarily conceded goals. However my biggest concern, one that has left me red faced from screaming at the pitch or TV is his complete inability to pass the ball forwards, and his constant need to slow down any sort of play that runs through him. I have seen him countless times singlehandedly kill off promising counter attacks. Now although physically a lot stronger than his Spanish counterpart, this isn’t a necessary part of a defensive midfielder’s game, and can be worked around. I strongly believe given the right instructions and advice, Romeu would be able to anchor that midfield, already proven to us that he reads the game better than most. Perhaps it’s time then, to finally abandon the hopeless chase for the next Makelele (there will only ever be one) and finally embrace the Spanish way, letting Romeu have a run in the first team, with an eye to a deep playing master class partnership with Oscar in the near future. Added with our now attacking abundance upfront, our team could really be a force to reckon with for many years to come. Now don’t get me wrong, I understand that we have a long season, and I fully expect everyone in the squad to be playing a fair bit, I just feel this may be the way forward for the future, but hey what do I know, I’m a football fan! Well as much as I’ll want to agree with you on romeu as a future player i still strongly feel with the pattern of the premiership generally we still need a holding midfielder that would not be bullied by opposing players like when playing against a robust side like tottenham. So mikel is still very very much more relevant than romeu ,ever imagined why most coaches prefer him over the others?. Very odd that he hasn’t had a longer run, would seem a better solution than the Lamps Mikel pairing. Dont know whether he can tackle though but neither can they !! Nice article, when i saw him play at the beginning of last season he looked brilliant. Like you said he reads the game well, quick passing and i think he is strong enough. The only problem is there is some kind of clause in his contract with barcelona and it looks like chelsea dont want to trigger that. Which is a shame because because i think hes a lot better than mikel. It’s been statistically proven on another website that Mikel passes the ball forward more than all but 2 DM’s in the premier league, so your comment “his complete inability to pass the ball forward” is not only stupid but has been statistically proven to be wrong. You may want to research this a bit, it might interest you to see just how wrong you are. Romeu started brightly last season but his form fell away. He has a lack of pace and often looked ponderous. The only reason you guys compare every little player with Mikel and pronounces your result to be…. better than Mikel is the simple fact that Mikel doesn’t score goals or at least has not yet scored one goal in the premier league. Apart from this fact every other reasons you guys put forward has been statically wrong and has proven to be false all the time! Dear writer, is this article about “your persived” flaws of Mikel or the Impressive Qualities of Romeu (because you mentioned none other than reading the game well)? I think the problem is that you’re biased about Mikel which is why you don’t bother to find out the facts about his game! I’m surprised that you’ll say being physically strong is not a necessity for a DM. When RDM restored Mikel back to 1st team, I bet you did not notice how imperious he was! The real issue which you fail to address (due to your likely biased towards Lamps) is that in a double pivot, Lamps often goes & stay in attack hence exposing Mikel. This is confirmed in our match against Newcastle where Meireles played & was disciplined with attacking. 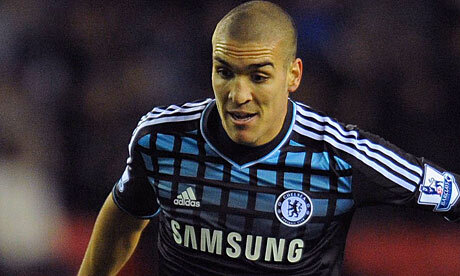 I like Romeu, & I believe he should play more but not as Mikel’s replacement, rather as his partner! It interests me what do you class as a defensive mid, because Mikels not actually occupying a defensive midfield position, rather a central midfield role with defensive duties so when you say he passes forward more than all but 2 DMs in the premier league i’d like to know what exactly you class as a DM. would you have classed someone like Song as a DM? It seems its a rather ambiguous term as there are very few players who actually occupy that Makelele style role dubbed the ‘defensive midfield role’, many players sometimes described as ‘defensive midfielders’ such as Parker or Song often contribute a lot to attacking movements of play, do you class Mikel in the same bracket as these player. It seems you use statistic to back up your argument yet as is apparent here statistics are so often distorted. There are lies, damned lies and statistics. This is a good article based on continued observation of the game as opposed to statitics read after a match. Far more can be gained from observation of the game and an appreciation of players contribution as a whole as opposed to facts and figures on paper that never tell the whole story. To the actual writer I would agree Romeu is a promising talent, and would definitely be a valuable player to Chelsea were he to get a run in the team I would say he does need to improve his physical presence. Though not as integral as is often made out, physical presence in the center of midfield is a valuable quality in the premier league. Disagreed with you, the role Mr Mikel is playing is one of the most dificult role to play, even the best player in the world will become flop their. You can only see when Mikel gives wrong pass or slow down Attack but failed to see best of him, you can never force your self to pass through closed door rather you turn back for another way. Mikel was impressive last season which every body knows that, the only inform players at chelsea are Cahil, Bertrand, Cole, Hazard and Torres, the rest are struggling to regain their form, dont see Romeu any way near him, Chelsea staffs and RDM knows their ability more than you and me, you better stop that racism. I think Romeu will get more playing time now and will show his true talent. But the most under-estimated player in the squad right now is Oscar. He is being given time to adapt to the English way, but he is likely to be as impacting as Hazard. I think the Oscar-Hazard partnership will be the revelation of the EPL this season. Mikel was garbage for most of last season and I particularily remember when Romeu replaced in him the team around the christmas period our passing and transitional play was much quicker.He was very poor on the pre- season tour and against City in the charity shield.In the 3 league games he has been average at best and as soon as he goes past the half way line with the ball he clearly has not a clue what to do.If you watched the athletico game you will have seen that he had neither the agility or mobilty to cope as their skilful pacy attackers waltzed around him.As well as buying a lot of attacking players the club should have been looking to replace Mikel(and his equally immobile partner in DM ,Lampard) with .one or two top class specialists in this position.ie Tiote .Moutinho. If you guys could say the same for lampard chelsea will be a much better side defensively. Your stats on Mikel are without basis. On statistics Mikel is the best defensive midfielder in the league (Check the index). Lampard is the main problem because RDM cant drop him. I would happily play Mikel and Romeu or Ramires in that midfield. If RDM fails to see this he will be gone by January believe me. I think RDM is tactically poor to be honest the way we lost to atletico shows dat. Spanish teams are always good on the ball you have to defend solidly and hit them on the break, you rarely outpass spanish teams. If you look at our home game against valencia last year you can have the answer unfortunately you dont seem to understand football you write what you hear in pubs. Di Mateo loves for Lampard blinds him to see he’s not never will be a contention midfielder. We played our worst games with false Lamps as defender(just cause he wants to play, no matter he imbalance the team). Di Mateo have to chose between Mata and Lampard game by game but never play them together because we loose contention in the middle and the strikers never get the ball and the defense get tired and concede spaces. Dumb Di Mateo to loose the supercup, entirely his blindness. I vote to sack him ASAP. romeu is good and he need chances to play he can create more chancesfor strikers and mid attckers to score goals and the talent of romeu ,joshmecran,and paizon talent will be more important for coming future. Its so easy for ur British guys to talk abt how negative Mikel’s game is, while ignoring Lampard’s total lack of defensive discipline. Someone shud pls inform Lampard dat we now have better attacking players, so if he can’t be disciplined and stop exposing our defense, he shud be benched. I agree wit emeka and jimmy. Lamps is too inactive as a dm and both mikel and romeu can pivot d midfield cos u nd dm who watch out for d back and also d front and not always lookin 2 score. Di matteo is tactically poor and is afraid of d old guard. He shuld have used two wide men to open atletico’s defence. They formed a v shape & we kept passin d call hopelessly around. Don’t know hw to start this,but if u look critically into the new adopted style of chelsea,lampard has been our problem so far. He leaves his position trying to prove that he is better than mata……is he?don’t think so… But as far as im concern, mikel is the best DM in EPL and its inability to attack is owing to instruction been given….. I think the best person to pair mikel in that role for now is ramires…he is a beta player in midfield than a winger…… Forget about your biased statistics……and focus on hw chelsea will improve without lampard…. There are people wasting their time in the name that they ‘re watching futbol match. If Mikel is as bad as you published in this your article,who is that coach that failed to use him and I will tell u how he ended. Mikel remains one of the chelsea player that does not go un-notice in any big matches weither wining or losing.Moreover,he is not a DMF but an OMF. He was converted by Jose.Here in Nigeria,Mikel is being played in a CMF role and we watch and enjoy the best of him. Mention ten PL players that has the ability to give an accurate passes,then I will show you where Mikel lies among them. Glad to see that the actual readers had more sense than the very author! Lampard has been our main problem recently.He not only vacates the space next to Mikel(which usually leaves him one against three) but also interferes with the room Mata,Hazard & Torres have to operate in.He stands smack-dab near Torres,bringing his marker near Torres.Unlike other midfielders who provide service to the forwards,he EXPECTS service from them.Lampard is purely goals.I believe he has much more facets to his game to be a perfect Xabi Alonso but unless he stops this obsession of trying to usurp Kerry Dixon in the charts we will always suffer!! Lampard needs discipline not Mikel!! Just ‘cos Lamps’ is a legend it doesnt mean he’s excempt from criticism.He’s 34 now,clearly he’s not the future so unless we start phasing him out any understudies wont have the required experience when we need them most.We just need two defensive stalwarts to do their job with no fuss while the front four do their thing. Mikel ahead of Romeu is the best option. ¶ will say you don’t really know Mikel. I think it was a mistake to let both, essien & Meireles go. There both top players for that Defensive midfield role. Granted essien wasn’t at his best compared to him a couple years ago. But he never really got that many games to prove he’s back. Meireles was great last season. Scores 6 goals I belive. Not bad for a DM. It was great to have a DM scoring goals. No disrespect to Mikel. With those both gone, I reckon di matteo needs to start thinking about the defense of Chelsea. I would like to see Ivanovic in cb more. Are new right back at right back. (can’t spell his name) and David Luiz in that DM role. He’s a great player. Just hasn’t got the brains of a centre back. He’s strong , quick and has a decent right foot. He would be great for DM. I know we have plenty of options in the 3 attacking midfielders, but I would like to see lampard in the middle in the easier games, he’s a great goal scorer.